For half a century, the People’s Republic of China took only limited note of Latin America, a region over which the United States exercised real political and economic hegemony. This period of indifference is today at an end. For five years now, China has been extending its investments from the Rio Grande to Tierra del Fuego, and is now a leading partner of Brazil, Argentina and Chile. Yet, this new presence is raising doubts and anxiety both in Latin America and in the United States, which is less than enthusiastic about China’s involvement in the region. China has also run up against the ambitions of India, equally concerned about supplies of raw materials. Chinese manufacturers have the capability to significantly undercut prices offered by foreign competitors over a wide range of products. Today, as a result of the China price, China has captured over 70% of the world’s market share for DVDs and toys, more than 50% for bikes, cameras, shoes and telephones, and more than one-third for air conditioners, colour televisions, computer monitors, luggage and microwave ovens. It has also established dominant market positions in everything from furniture, refrigerators and washing machines to jeans and underwear (yes, boxers and briefs). This article examines the eight major economic drivers of the China price and provides estimates of their relative contributions to China’s manufacturing competitive advantage. Lower labour costs account for 39% of the China price advantage. A highly efficient form of production known as industrial network clustering, together with catalytic foreign direct investment, add another 16% and 3%, respectively. The remainder of the China price advantage is driven by elements challenged as unfair trade practices by foreign competitors. These include export subsides, which account for 17% of the advantage, an undervalued currency (11%), counterfeiting and piracy (9%), and lax environmental and worker health and safety regulatory regimes (5%). China is no longer an outsider to the co-operation among and networking of non-governmental organisations (NGOs) across national borders. Chinese NGOs, in particular international NGOs (INGOs), have expanded their connections transnationally with civil society. Co-operative projects are concentrated in areas of gender, environment, public health, poverty and education, where the Chinese government requires assistance in tackling a range of social, environmental and rural problems associated with pro-market reform. Transnational collaboration in shared ideas, funding, advocacy and campaigns helps Chinese NGOs to provide their services and, in many cases, thus challenge the social status quo. It is also helping to further the growth of an NGO community in China. More importantly, despite their apparent non-political nature, transnational links among Chinese NGOs transfer democratising views and practices to grassroots communities and organisations, which could in turn further the country’s broader socio-political development. 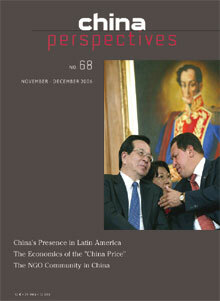 The paper describes and analyzes crucial elements of cultural and national identity-building in China from the 19th century to the present: the unfolding of the identity crisis following its repeated defeats by Western powers in the 19th century and the attempts of China’s intellectual elite to develop a new cultural and national identity. The paper also deals with the main currents of identity-building and the perception of the West since the 1980s by discussing the rising importance of Confucianism, the role of history and language, and the renaissance of Western thought after the decline of Marxism-Leninism. Finally, the focus will be on the emergence of different types of Chinese nationalism since the 19th century and the recent discourse on nationalism. The period between 1950 and the late 1970s saw the birth of modern poetry in Taiwan and its emergence from a rebellion that took place both within and against the overarching influence of classical poetry, which it finally replaced. During this period it created its own language and cultural space, and finally found its rightful place among the general cultural activities of the time. At a time when “poets could not avoid forming alliances”, as Yü Kwang-chung (CHI#1) has observed , the journals and the movements for which they provided a voice and a rallying point, played an essential part in encouraging reflection on the nature and role of contemporary poetry, and in developing its language. In addition to the poems they published, the authors they introduced, and the translations of foreign works they made known, each of these journals expressed clearly defined theoretical choices, and made their own contribution to what came to be known in Taiwan as the modern poem (CHI#2, xiandaishi).